I have an end of the year ritual that usually happens every December 31. I must select a new journal for the coming year. It is a dilemma! I have several empty ones on my shelf right now. I have some that I love, and I have others that I like. It may not sound like a big deal, but I will have a relationship with this book for the year. It will meet me every night when I go to bed, and it will travel with me wherever I go. This book will hold my thoughts, my wishes, as well as my hurts and disappointments. It will be my companion. My new journal needs to feel good in my hands, and it needs to be beautiful; worthy of the secrets I will tell it. Here are some of my choices. 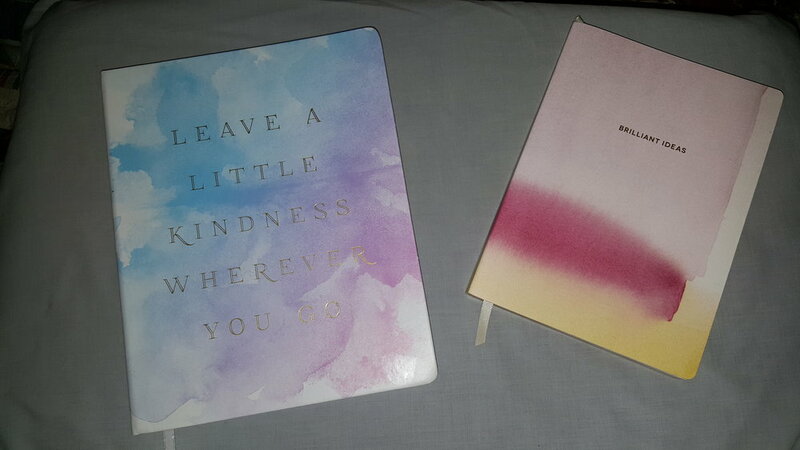 My daughter and her husband gave me two new journals for Christmas, and they are lovely books. They both have sweet sayings on the cover. One says “Brilliant ideas,” and the other says “Leave a little kindness wherever you go.” Perhaps one of these would be my secret keeper for the year. Another one from my shelf is black leather with a tree carved into the cover. I have great admiration for trees and leaves (that’s another blog for another day), maybe this should be it. Then yet another, light brown leather with a Celtic tree of life on the front and Celtic knots surrounding the border. It has the rustic paper with no lines on the inside; this would be sweet to write in with fountain pens. Another lovely journal to consider is one that is a deep purple color with lovely delicate flowers. I love to garden and plant flowers. There is another that a friend gave me. It says, “A gardener’s journal” on the cover and it has a vintage look and appeal about it. This takes much pondering because I genuinely love them all. As I write this, it is December 31, 2018, and I have made my decision … but I will very likely change my mind come the evening of January 1, 2019. I’ll let you know what I decide. In the meantime here are pictures of them. Do you have a favorite? GOAL: Make better use of my time this year. Use a timer and set limits so I am aware of how I am spending my time. This will also help me keep focused on the task at hand. Get my clothes ready the night before, so I am ready for the next day. I can adjust these at any time, but right now this is my action plan. I have found that the weight loss plan doesn’t work for me. So instead I have decided my real wish is to be healthy. To make it a goal, I examined what healthy meant to me. I’ve heard the proclamations of, “I will not eat sugar for the 2019 year!” Nope, that will not work for me because healthy (to me) also means happy mind, body, and spirit. I like cake, cookies—and I adore chocolate— so now what? It would make me sad not being able to enjoy a cookie with my great nieces and nephew; however, I can eat fewer. I can slow down and savor what I am eating. I can also move more. I started this plan about 18 months ago and have become more aware of what I am eating. I also bought a Fitbit to help stay on track with how much I am moving. I’ve shed about 20 pounds in those 18 months. It is very slow, but I continue to progress. Slow progress is still progress!! I have stories that I want to write this year, too. I got out a second composition book for stories. Once I set up my action plan steps, then I will chart it on my calendar with sticky notes. This way if I run into a life situation I can easily reschedule the plan. I expect that this plan will work and I can tweak it at any time. The only cost to get started is two composition books and the time to write down my wishes, goals, and action plan. What wishes are you turning into goals this year? Make sure you set up an action plan to get there. I have spent the past week craving peanut butter cookies; I am not sure why. I did my very best to ignore the desire, but alas, I gave in today. I went to my cookbooks and pulled out one of my favorites. It was one of those fundraiser cookbooks that have recipes from lots of people. I am sure you’ve seen them before or have even participated in being a contributor to one. The recipes in those books are usually contributors’ favorites, tried and true. This one was put out by the New York Farm Bureau in 1983 and given to me by my husband’s Aunt Maureen in that same year. Over the years many of the pages have become stained, proof that I use this cookbook quite a bit. I turned to one of the most heavily stained pages, the one with the Peanut Butter Cookie recipe. Ernestine L. Walden submitted it. I don’t know her at all. I began wondering about who she might be. I called Aunt Maureen and asked her if she, by chance, knew Ernestine. She didn’t. We chatted for a while, and I hung up the phone. Just a few minutes later Aunt Maureen called me again, she had done some research on Earnestine and gave me some details. Ernestine L. Walden was born Jan 20, 1924, to Ernest and Mary Swartz Kenyon, I am guessing she was named after her father. She died January 21, 2017, one day after her 93rd birthday. She married in 1941, and her first husband died in 1971, she remarried a year later to William J. Walden, and he died in 1996. Her obituary stated, “Mrs. Walden was a proud homemaker who raised five children. She was a member of the Christian & Missionary Alliance Church in Franklinville and the Farm Bureau, and she delivered Meals on Wheels”. She sounds to me like she was a lively woman — someone you’d want to get to know. I enjoyed learning a little bit of her story. I wonder how many people out there have adopted her cookie recipe and have made them part of their stories. I know it is part of mine. So, here you go! Here is Ernestine’s Peanut Butter Cookie recipe. Give it a try, tell me what you think. Will it become part of your family story? This year my husband and I decided not to have a Christmas tree. It's not that we don't like Christmas trees, on the contrary, we love them. However, this year we decided to be much more simplistic in our decor. I had surgery on November 19 on my right hand for carpal tunnel syndrome; it was quite severe in that hand. Next week I will have the left hand done too. At this moment my right hand is sore but healing very well. It will be lovely to be able to go through life without my hands falling asleep when I write, sew, sleep, or any other activity. I am thankful. Steven and I have about 10 boxes of decorations, this year we took 2 out of the attic and used only about 1 box worth of decorations. I most certainly wanted to do something decorative in the house to acknowledge the season, so I went into my craft room and gathered up some white branches I had that were leftover from our daughter's, Genette, wedding. From my garden, I brought in a tower I use for my morning glories to climb and cleaned the dirt from it. From the boxes brought down from the attic, I used some of the artificial poinsettias and tree ornaments. I came up with my Christmas Un-tree. I also took out some fabric and ribbon and wrapped the pillows on my sofa to look like packages. I like it. It will be easy to take down after the season as I continue to heal from my hand surgeries. Genette and her husband Abe will be coming in the weekend before Christmas. Our youngest, Carmen, will be here too and we will skype in our son, Bryon, and his fiance, Amber. We will open gifts from one another then. On Christmas day our youngest will host Steven and I at her house. Genette and Abe will be with his parents. A couple of weeks later I will take down our Christmas Un-tree and put everything away. Then I will store the memory and will tell the story of, One year we had a Christmas Un-tree. May you have the most joyous of celebrations with your family and friends throughout the season.